This is thanks to his stated intention to double the number of people employed in the sector. 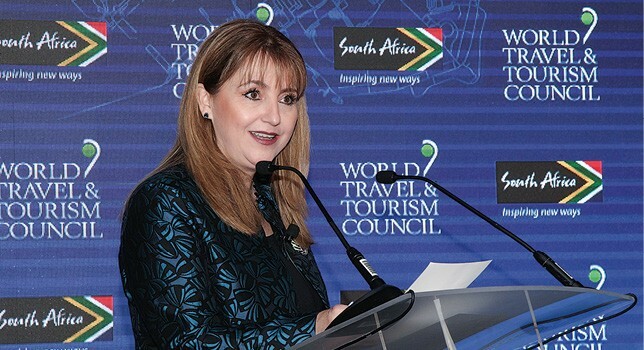 The accolade came from the mouth of Gloria Guevara, the President and CEO of the World Travel and Tourism Council (WTTC). 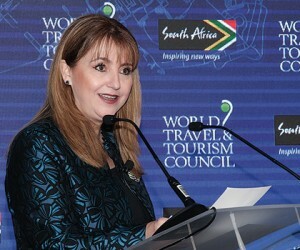 Speaking on 22 November at the inaugural WTTC Africa Leaders Forum in Stellenbosch, South Africa, which was hosted by Tourism South Africa, Guevara commented: “In his State of the Nation address in February this year, President Ramaphosa not only mentioned the ‘incredible opportunities’ of travel and tourism, he also set a powerful target to double the number of people directly employed in our sector from 700 000 to 1.4-million. “Travel and tourism is, without a doubt, South Africa’s greatest engine for the creation of jobs and the alleviation of poverty. It contributes to social equality, encourages the integration of women in the workplace and enables economic self-reliance. It provides employment in parts of the country where other jobs may not exist, and generates a sense of self-worth. We praise the government for recognising those ‘incredible opportunities’ of our sector and the steps it has already taken to realise the potential. “We see those opportunities falling in three broad areas. We congratulate the government of President Ramaphosa for its efforts to reform the visa process so that more tourists from more countries can visit the country and recommend that this is rolled-out as widely as possible. Secondly, we support the long-held ambition to fully liberalise the continent’s air services. Finally, we see the benefits of South Africa’s continued adoption of biometrics as a way to make travel safer and more efficient. Travel and tourism is already working from a strong base, with the latest annually published WTTC data indicating that the sector currently contributes a total of 8.9% to South Africa’s gross domestic product (GDP) and creates 726 000 jobs directly, a figure that grew to 1.5-million when all the indirect impacts of the sector are taken into account. Recent figures from Statistics South Africa show that, of the 15.8-million workers employed formally and informally in South Africa in 2016, 4.4% (or one in every 23 people) were directly employed in the tourism sector. This compares to 3.8% just 10 years prior. Furthermore, the 690 000 people employed in the sector in 2016 outnumbered those in both mining (444 000) and utilities (118 000). That same year, the tourism sector directly contributed to 2.9% of South Africa’s GDP, making the sector larger in terms of GDP than agriculture, although it is still smaller than construction and mining. As an organisation, WTTC represents the travel and tourism private sector at a global level, with a membership numbering more than 170 chairs, presidents and CEOs from companies in every part of the industry. It is not only travel and tourism companies that are promoting the industry. The financial sector is also eyeing the lucrative sector as a potential “silver bullet” for the ailing South African economy. The visa issue represents a particularly appetising case of low-hanging fruit. With the resignation of Malusi Gigaba as the Minister of Home Affairs and a Member of Parliament, the time is ripe for South Africa’s tourism-killing visa regime to be amended, in the hope that tourists will give the economy some much-needed CPR. This is the view of Cannon Asset Managers’ Investment Analyst, Tlotliso Phakisi. The infamously unfriendly visa requirements for which Gigaba will be remembered have crippled the tourism industry by throttling the volume of tourists entering the country. Perhaps the most damaging blow of all was landed by the controversial requirement—frequently derided as nonsensical—that visitors travelling with children under the age of 18 years must provide their unabridged birth certificates (UBC) upon entering or exiting South Africa. Bad press associated with negative experiences suffered by unprepared travellers deterred families from visiting our shores. Faced with the uncertainty and stress of the onerous visa requirements, travellers simply opted to go elsewhere. The direct impact of the visa regime has been measured by the Tourism Business Council of South Africa (TBCSA), which estimates that more than 13 246 travellers were prevented from entering the country between June 2015 and June 2016 after failing to meet the UBC requirements. When considering how much tourists tend to spend, it is clear that the country lost many millions in potential revenue during this period alone. Of course, the indirect impact is more difficult to gauge—there are no statistics for the number of people who were simply put off or who changed their minds—but the multiplier effect is likely to be substantial. Now, South Africa has the opportunity to put that episode in the past and restore the travel and tourism sector to its rightful place. “Despite this, however, tourism has been one of the few sectors in the country to consistently show promise and resilience in terms of both job creation and economic growth over the past few years, demonstrating its potential as the lever needed for turning things around in the short term,” says Phakisi. Within the broader context of travel and tourism, the hotel industry is a sub-sector that promises to deliver excellent employment opportunities and a steady career path for school leavers and post-gap year individuals. The fact is that the industry averaged R16.6-billion in hotel room revenue in 2017 and this is forecast to increase by an additional 5.6%, according to PwC’s Hotels Outlook. Considering that the rest of the economy is troubled by economic and political unrest and that a devastating drought continues to plague one of our largest tourism regions, the hotel industry’s consistent growth only serves to make it all the more attractive. The PwC Hotels Outlook report reflects that 2017 saw a 7.2% increase in foreign visitors from outside the continent to South Africa alone. Cape Town is ranked by the International Congress and Convention Association as the best business tourism city in Africa, while Johannesburg has earned the distinction of being ranked by Euromonitor International as being among the top 100 city destinations in the world. Durban, Johannesburg and Malelane are primed for six additional four-star hotels, which are scheduled to open between 2019 and 2021. Bezuidenhout points out that even though new technology is being introduced to every sector of the market all the time, there will always be a need for human interaction in the hospitality industry. What technology is changing is the focus of human interaction—away from time-consuming routine to better customer service. As Forbes.com points out, customer relationship management (CRM) systems are already part of the mix, while technologies such as speak-to-order technology, augmented reality (AR) to better direct customers when on site, and biometric authentication (facial recognition) have been highlighted by Gartner as key future trends. By letting technology take care of these aspects, human staff will be able to focus on customer service and delivering rich experiences to keep guests coming back for more. Technological advances also have implications for training, making hospitality an especially relevant field for the tech-savvy youth. “We are not oblivious to the generational requirement of staying ahead of the curve as far as technology is concerned—especially from an educational standpoint, so we have and will continue to diversify our learning methods that make our intimate classroom environments interactive, using practical and blended learning teaching methods,” explains Bezuidenhout. Another recent development that is calculated to enhance the reputation of South Africa’s tourism sector as a whole is the gazetting for the implementation of the new and revised grading standards for South Africa from 1 April 2019. As announced by the Tourism Grading Council of South Africa (TGCSA), the objective is “to advance and maintain a recognisable, credible and globally benchmarked system of quality assurance for accommodation and venues in South Africa”. Two new categories have been introduced in the form of “apartment hotels” and “small hotels”, which will also cover luxury accommodation in the form of boutique hotels. Those products “that far exceed premium expectations with respect to quality standards and service excellence” will now be recognised with a new 5-Star Premium grading level. For too long, five stars have not been enough of an indication to tell the truly exceptional apart from the average. Niche market differentiation also comes into play with the new grading system, as the TGCSA has introduced a range of “accolades” that “include insignia and criteria for niche markets such as child-friendly, pet-friendly, wedding venues, spa and wellness facilities, 4x4 etc.”. The accolades offering also includes the category of responsible tourism. The idea is to encourage tourism businesses to operate more responsibly and limit their environmental impact. Protecting the environment also translates into preserving jobs. “In the Western Cape, tourism is one of our major job creators, creating more than 300 000 direct and indirect job opportunities. By committing to using more local suppliers and services, and fair labour practices, the tourism industry can ensure that tourism is also economically and socially responsible,” Minister Schäfer said. It is to be hoped that tourism destinations outside of the Western Cape will take advantage of the opportunities offered by the new grading system. 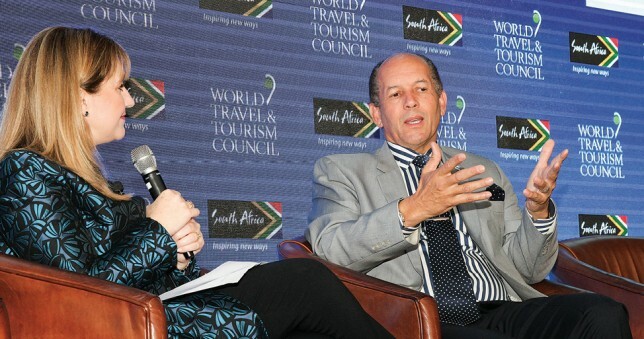 “The approved enhancements to the grading system create greater value for our members and will further aid the Tourism Grading Council of South Africa in upholding and improving the competitive positioning of South Africa as a quality destination,” comments Darryl Erasmus, the Tourism Grading Council of South Africa’s Chief Quality Assurance Officer. “The implementation date of 1 April 2019 offers sufficient time for us to consult and socialise the revised grading system with all the stakeholders. It will also enable our members to ready themselves for their next assessments based on the revised criteria,” he adds. “This would not have been possible without the participation of our valued stakeholders and we are immensely grateful for their involvement. I would like to thank the industry for their contributions and inputs as well as their patience whilst the TGCSA completed this revision process. The valuable inputs of all our stakeholders have resulted in a set of criteria that are globally competitive, yet uniquely South African,” concludes Erasmus.